Over the years, our technicians here have gotten tremendous experience in Toyota vehicles. Toyotas are very popular vehicles ranging from small compacts to SUVs to full-size trucks. We see all the different models daily. We frequently hear about the dissatisfaction of customers who bring their Toyotas to the dealers. We take the extra step to give you the best customer service, and welcome you with warm smiles in a timely manner. We are qualified to inspect these cars and know where underlying problems may creep up on you. We have the knowledge and information to give you a heads-up on recalls or technical service bulletins. Lead tech Keoki is a master in diagnostics with Toyotas. 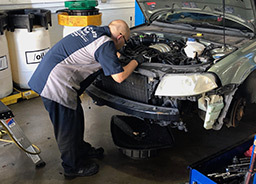 He can diagnose your check engine light, airbag light or even perform programming that may be needed to keep your vehicle in top running order. Bring your Toyota in today and you won’t be disappointed. 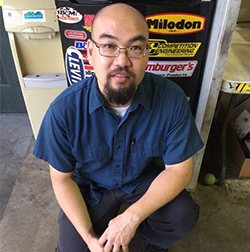 We are grateful here at Pearl City Auto Works to have a tech like Gene. He has become an asset to our establishment by taking the initiative to become a master tech in the Nissan field. He has gone through extensive training and got beneficial experience working years at the Nissan dealership. He is familiar with all the different models that the Nissan family holds. We are qualified with the needed information to get recalls and technical bulletins on these vehicles. All equipment is up to date and capable of servicing and diagnosing your Nissan. Gene knows what it is like working with the dealer, and that is why is he knows that we can give you the customer service that you deserve. Bring your Nissan in today and test our experience. 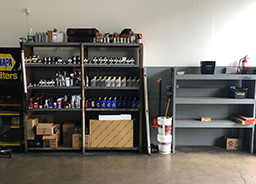 We take pride in our clean and organized shop! If you are looking for a trusted Pearl Harbor auto shop, come visit and let us get you back on the road. Master technician Troy hard at work here at Pearl City Auto Works. 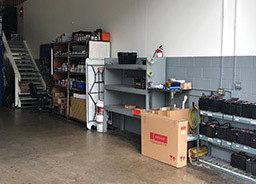 We have been proudly serving Aiea auto repair needs since 1987! Here we see Gene thoroughly checking the radiator. 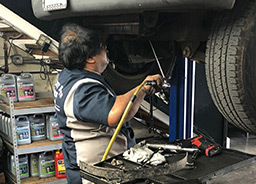 We are a full service Aiea auto repair shop! Looking for a new mechanic? 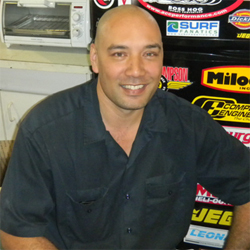 Come check out Pearl City Auto Repair Honolulu! We do it all from oil changes, to complex engine work.